If you pay any attention to your site’s analytics, you may have noticed by now that people are finding your blog on Pinterest. Pinterest is a visual bookmarking site where people share what they like by “pinning” their favorite sites onto boards. Other users can repin and add their own comments. Pinterest is the third most used social networking site next to Facebook and Twitter, it’s time to jump on board (no pun intended)! Let’s assume someone goes to your website or blog, and sees something they like enough to share, what can you do to help them to pin your site and spread the word? 1. Add images to EVERY post and page. Pinterest is visual, so the first thing it’s going to do is look for images on your site. No image, no pin! You may even have to make up an image (like in this article) with the name of the post. This gives a quick visual of what the article is all about. 2. Use interesting images that tell a story and represent what your web page or blog post is all about, yet make someone curious enough to click and read the whole article. 3. Use multiple images in a post whenever possible, without going overboard. This is especially important for how-to-type articles. People love images, it reinforces reading, and helps them to skim over an article on subsequent visits. It also gives pinners a selection of images to pin. 4. Add Title Tags to EVERY image. This is a best practice anyway, but it’s especially important for pinning images in Pinterest. Ever wonder where the text comes from that pops into the area where you can write a description? This is the Title Tag that you specify for the image. Think of it as suggested text for someone pinning you page. Make it as descriptive as possible, and enticing for potential visitors. For good measure, you should also add Alternate text to each image. 5. 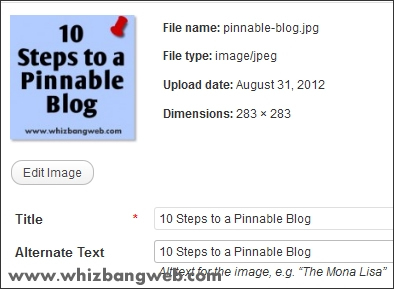 Consider adding a watermark to your images with your blog address. Pinners sometimes don’t link back to original articles, so this will help ensure that you still get credit for your ideas, and traffic going to your site. I’ve demonstrated that in articles on this page. 6. Beef up your page titles. In case you forget to add alt text to an image, Pinterest picks up on page titles as starter text in the description area. 8. If you notice an article is getting a lot of Pin love, start your article with a special note to welcome pinners inviting them to further explore your blog. Also make sure these articles are current, making updates as necessary. 10. Get on Pinterest! It helps to understand where your readers are coming from, and what interests them. The best way to do this is to hop on over to Pinterest, create an account, ans see what it’s all about. Happy pinning! What else do you do to make your blog or website pinnable?